How Do I Know if I Have Flat Feet? Flat feet are not uncommon. In fact, nearly a quarter of the population has flat feet. Most of the time, flat feet don’t cause any significant problems. However, in some cases, flat feet can cause a person to develop pain in the feet and knees, shin splints, plantar fasciitis, and Achilles tendonitis. To learn more about how to identify and cope with flat feet, read on. How Can I Tell if I Have Flat Feet? You can get a general idea of whether you might have flat feet in two ways. First, look at your wet footprint. You should be able to see the toes and balls of the feet, the heel, and a strip connecting the heel to the balls of the feet. If you have flat feet, that connecting strip will be nearly as wide as the front of the foot. 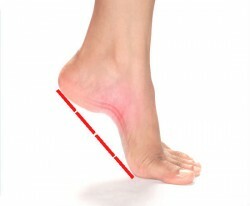 In a normal foot, that connecting strip will be roughly half the width of the front of the feet. In a foot with a high arch, there is only a very narrow band connecting the heels and the balls of the feet. Another way to figure out whether you might have flat feet is to look at your shoes. Set them on a flat surface and look at them from behind the heel. If you have flat feet, the shoes will be more heavily worn on the inside of the shoe, particularly near the heel. The top of the shoe may collapse inward. Of course, neither of these at-home techniques is a definitive diagnosis tool for flat feet. If you have foot pain and suspect that you may have flat feet, you should visit a podiatrist or go to a specialised shoe store that performs gait analysis. Some people are just born with flat feet and have them all their lives. In other cases, flat feet can develop as a complication of an injury or illness. Flat feet can develop as the result of injuries such as stretched or torn tendons, inflammation of the posterior tibial tendon, broken bones, or dislocated bones. Chronic health conditions, including certain forms of arthritis and nerve damage, can also lead to the development of flat feet. There are certain risk factors that increase the odds of developing flat feet. They include ageing, pregnancy, obesity, and diabetes. The back and legs are painful. If you have any of these symptoms, you should visit your doctor or podiatrist for an examination. There are several things that can be done to care for flat feet. The most important step in coping with flat feet is a simple modification of the shoes. Wearing orthotic devices or custom arch supports inside the shoes will help to give the feet the support that they are lacking. Ask your doctor or podiatrist about the benefits of using these devices for flat feet. In order to cope with acute pain, your doctor may recommend that you take anti-inflammatory medication or apply ice to the feet. If you have flat feet, visit Foot Solutions. We can help you to cope with flat feet by creating custom arch supports that are specially made to give your feet the support that they need. When worn inside the shoes, these devices will support the feet and help to relieve pain.